Hugh (Buck) Thompson, Jr. died of cancer yesterday in a veteran’s hospital in Alexandria, Louisana. I first met Buck when I visited his home on Rockbridge Road in Stone Mountain, GA, when I was about 10 years old and in the Cub Scouts. His older brother, Tommy, was the assistant leader of the Den and was probably a teenager at the time. Subsequently Buck and I attended Stone Mountain High School together and played on the same football team. I visited his home a number of times during our high school years, and we became close friends, though he was a behind me in school by a year. When I graduated from Stone Mountain High, I lost track of Buck and the two of us never saw each other again. Buck was an ordinary kid, lanky and a bit uncoordinated like many of the rest of us, and he was left-handed. He played halfback on the football team and would occasionally throw a left-handed pass while running a sweep around left end. He was reasonably fast but not an especially gifted athelete. In fact, little about him in those years would suggest there was anything particularly extraordinary about him at all. However, when the opportunity arose, he proved to be an exceptional man indeed, even one some have called (and rightly so in my mind) a hero. Thompson: Let’s get these people out of this bunker and get ’em out of here. Brooks: We’ll get ’em out with hand grenades. Thompson: I can do better than that. Keep your people in place. My guns are on you. Thompson then ordered two other helicopters (one piloted by Dan Millians) flying nearby to serve as a medevac for the 11 wounded Vietnamese. 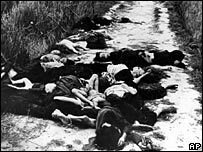 While flying away from the village, Andreotta spotted movement in an irrigation ditch, and the helicopter was again landed and a child was extracted from the bodies, and brought with the rest of the Vietnamese to the hospital at Quang Ngai. Thompson subsequently reported the massacre, whilst it was still occuring, to his superiors. The cease-fire order was then given. Kept in the dangerous OH-23 Raven Helicopter missions, which some considered punishment for his intervention and the subsequent media coverage, Thompson was shot down a total of five times, breaking his backbone on the last attack. He suffered psychological scars from his service in Vietnam through out the rest of his life. Although the My Lai massacre became one of the best-known atrocities of the war – with journalist Seymour Hersh winning a Pulitzer Prize for reporting on it – little was known about Mr Thompson’s actions for decades. Mr Thompson and his colleagues Lawrence Colburn and Glenn Andreotta were finally awarded the Soldier’s Medal, the highest US miltiary award for bravery when not confronting an enemy. Mr Thompson was close to tears as he accepted the award in 1998 “for all the men who served their country with honour on the battlefields of South-East Asia”. Heros, it seems, are just ordinary people who behave in extraordinary ways when life presents them the opportunity. I am honored to have known you, Buck. May you rest in peace. This entry was posted in Personal on January 7, 2006 by Perry. Perry: I read this article in the LA Times last weekend while visiting Rob in southern California – I was moved by the article and had Rob read it as well. I have since mentioned this to several people, and while reading your web tonight after you responded to Ben’s acceptance to IU, I find that you actually knew this hero. What the world could use is a few more Buck’s. Although Buck’s actions were extraordinary, he himself was just like you and I. What the world needs, in my view, is for more of us ordinary people to act in extraordinary ways when the opportunity arises.